The most important thing you can do is read your instruction manuals-ALWAYS read them to determine the best way to care for your electronic devices. Before cleaning your devices make sure they are turned off and cool to the touch, you can damage your screens if you wipe them down warm. First, blast your keyboard with the compressed air to loosen any dirt. Turn the keyboard (or laptop) upside down and tap gently to release any dirt from the keys. Use an electronics wipe to gently wipe down the keys. If you need to clean between the keys you can use a cotton swab-if a dry cotton swab isn’t doing the job dip the swab in rubbing alcohol and squeeze it out until just barely damp. It’s very important you don’t get liquid in your keyboard! You want it just damp enough to clean any residue off the keyboard service! After your keyboard is clean use the electronics wipes to wipe down the monitor and computer tower as necessary, don’t forget the back of the computer around the fan as well. The same procedure goes for TVs, etc. Use the electronics wipes to gently clean them making sure they are cool beforehand. Cleaning remotes is a HUGE one for me-remotes are touched by everyone in the family and can be a breeding place for germs. Plus, a clean remote is one of those small touches that make your home look extra clean, you may not think about it but a grimy remote gets noticed! 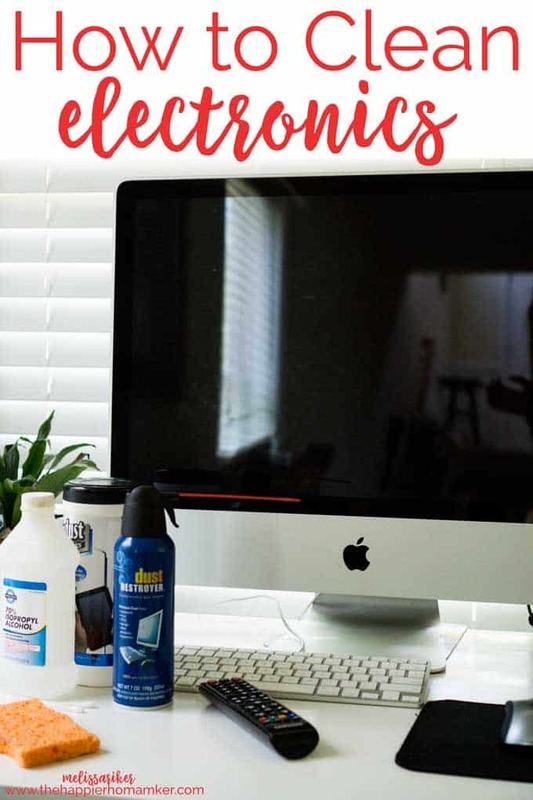 Wipe remotes down with electronics wipes and use the damp cotton swab/alcohol method above to clean between the keys and the key surfaces to kill germs. Do you clean your electronics regularly? Any tips to add? Let me know in the comments!